Plagued by too many cables? Here’s a creative cure. Skiva USBLink Duo cables have a standard USB plug on one end and on the other, a Lightning plug and a micro-USB plug. This sleight-of-hand is accomplished by stacking the two plugs, one inside the other. You sync or charge your iDevice via the Lightning plug as usual. When the need arises to charge a different device, pull off the Lightning plug and underneath it, there is a micro-USB plug. The small Lightning plug tip won’t get lost because it is securely tethered to the end of the cable. That’s thoughtful design. 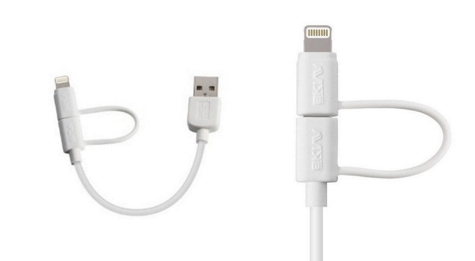 Skiva makes this USBLink Duo cable in two lengths: 3.2 feet (1 meter) and 6 inch (15 cm). At home or in your office the longer cable makes sense. When you travel with a MacBook, the 6 inch cable allows you to sync and charge right next to your machine without cable clutter. 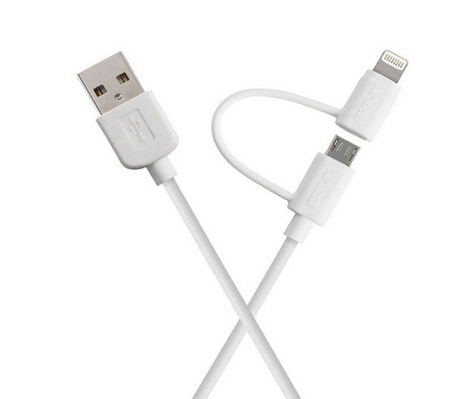 If you travel, this cable belongs in your bag as it takes the place of the two cables you normally carry around. Two-for-one simplicity and convenience. These USBLink Duo cables are Apple-certified and contain Apple’s authentication chip. Do not be tempted by cheaper versions that are not certified. They will fail quickly and some will not work at all. Availability is sometimes a problem as these cables are very popular and sell out frequently. If they are not available when you order, be patient, because stock is replenished often.